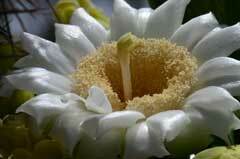 Family: Adoxaceae, Muskroot Family; previously Caprifoliaceae. Size: Up to 20 feet or more in height, often as wide as tall. Growth Form: Shrub/tree; short-lived, erect, multiple trunks, new branches shoot-up fast, prefers sunny areas, wood is pithy but hard. Leaves: Green, dark green; opposite, odd pinnate, 5 to 9 leaflets, deciduous or not, leaflets variable but often lanceolate, glabrous to hairy. Flower Color: White or cream; inflorescence of flat-topped clusters, flowers fragrant, fruits are berry-like, glandular hair globose or globular, raw berries may be toxic, prepared berries used in preserves, blue-black with a glaucous powder blue bloom. Flowering Season: March to June; March to September in California. Elevation: 1,000 to 9,000 feet. Habitat Preferences: Desert or intermediate upland areas, riparian areas, streams, washes, ditches and rural abandoned home sites. Recorded Range: This species occurs in western North America, in the United States; AZ, CA, CO, ID, MT, NM, NV, OR, TX, UT, WA, WY, in Canada in BC and in Baja California and northwest Mexico. North America & US County Distribution Map for Sambucus nigra ssp. cerulea. U.S. Weed Information: No USGS data available. Invasive/Noxious Weed Information: No USGS data available. Wetland Indicator: No USGS data available. Threatened/Endangered Information: No USGS data available. Sambucus nigra ssp. 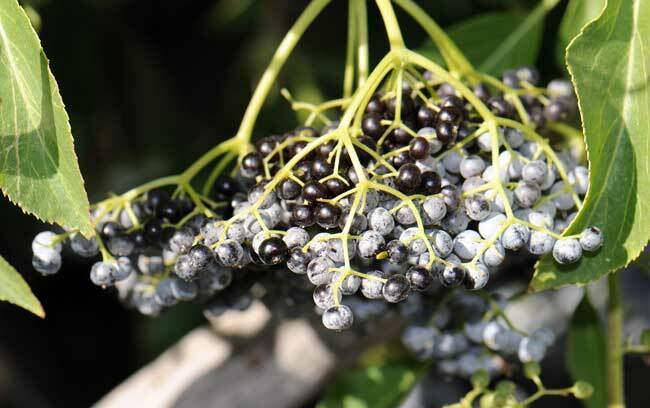 nigra, European Black Elderberry. 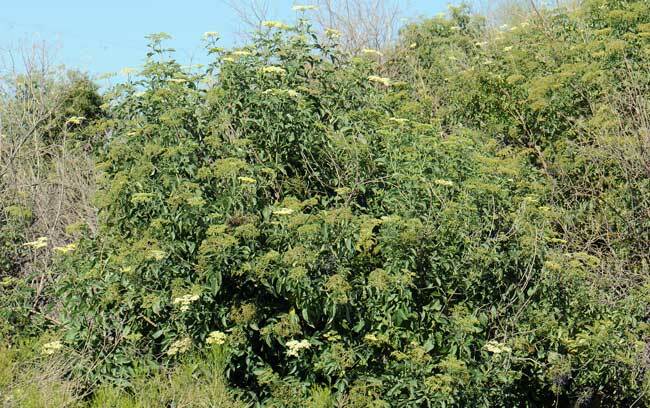 Species of Sambucus have undergone many taxonomic changes over recent years. Sambucus nigra ssp. cerulea is the result of a profusion of synonyms and alternate spellings of cerulea as coerulea. This is truly a "species complex", where a group of two or more species are very similar in appearance and where exact boundaries between them are often unclear. Comments: Sambucus is a world-wide genus with some species well known for their value as a food source, medicinal values and as an ornamental plant for their showy flowers, fruit and bright green lacy foliage. 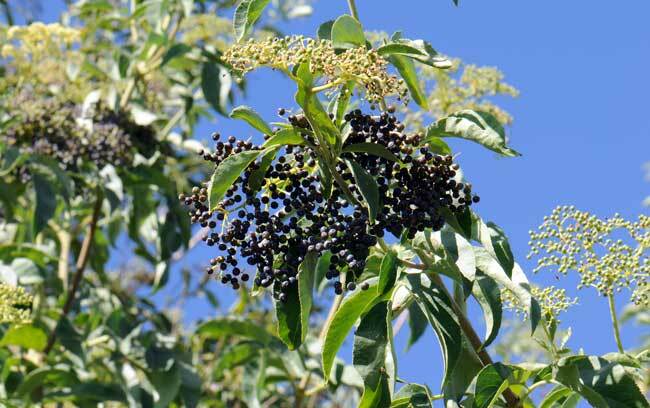 Local species of elderberry plants have been planted in Arizona as an ornamental and for their benefits to butterflies and birds. Similar species: Sambucus nigra ssp. canadensis, American Black Elderberry. Arizona Flora, Kearney, Thomas H., Peebles, Robert H., 1960, University of California Press, Berkley and Los Angeles, California, as Sambucus mexicana. Native Plant Information Network, NPIN (2013). Published on the Internet http://www.wildflower.org/plants/ [accessed: 10/31/2014]. Lady Bird Johnson Wildflower Center at The University of Texas, Austin, TX.